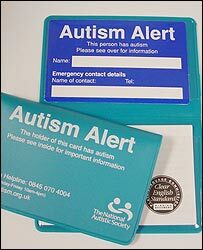 An autism alert card enables the holder to identify themselves to others as having an Autism Spectrum Disorder. It is designed for adults, for situations when communication may be difficult. There are a range of alert cards available across Scotland. See below for details of the different types of card which can be obtained as well as details on how to create your own. 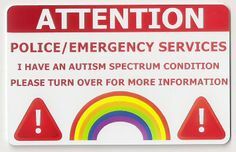 The ARGH autism alert card was made as an aid to communication. It is used in all parts of the community: shops, libraries, colleges, etc. It is an all round communication tool, not just to be used with the police, paramedics etc The card has been endorsed by Police Scotland. When talking is difficult, stressful, or when we need a prop, it will aid our communication. It is a way to communicate a need without alarming or confusing the recipient. It is designed to be mutually beneficial: to help to the autistic person and the person being presented with it, breaking down communication barriers. The card is available in two designs. For further details and to obtain a card click here. To read a report written on the ARGH Autism Alert Card click here. ASK is the Autistic Space Kit. It is an app which includes an alert card section that is fully customisable allowing for much more flexibility in the information people may want to add. The ASK project is a fully autistic not for profit project and you can find more details here . The Central cards cover the following areas: Falkirk, Fife, Stirling and Clackmannanshire. Partners of this card include Police Scotland, NHS and Scottish Autism. It is administered by Scottish Autism. For more information on this card click here or email alertcard@scottishautism.org. This card covers the following areas:Edinburgh, West Lothian, East Lothian and the Scottish Borders. Parners of this card include Police Scotland, Autism Initiatives and NAS. It is administered by Autism Initiatives Head Office. To apply for a card contact contact 0131-551 7260 or alertcard@aiscotland.org.uk. The Strathclyde cards covers the following areas:Glasgow; Renfrewshire; East Dunbartonshire; East Renfrewshire; North Lanarkshire; West Lothian; North Ayrshire; East Ayrshire and South Ayrshire. Partners of this card include Police Scotland, NHS, Scottish Autism, NAS, Glasgow City Council. It is administered by the Autism Resource Centre. For contact details for the Autism Resource Centre click here. Predesigned cards are only one option. Developing your own individualised Autism Alert card may provide the best option. Information on a variety of styles of alert card templates and consideration on how you may wish to create and personalise a card can be found here. The National Autism Association offers the Personal Emergency Profile Sheet as an addition to other alert card options. This offers further details to peope assisting in interactions with school staff, family, friends, neighbours, caregivers, police, fire and rescue professionals. You can find and download the profile sheet by clicking here.